dbcOS Refrigeration NH3 / CO2 Refrigeration applications and systems. Our refrigeration control system is based on the knowledge and experience of the end-users who utilize the systems, the refrigeration contractors who help to implement the systems, and our own people. The current system represents over 30 years of development. The core system provides functionality that simply can't be replicated using standard PLC/HMI development platforms. In effect, the custom programming procedures that would be required in a PLC-based system are replaced by simple site-specific configuration procedures. One of the most impressive aspects of the system is that we're told by our customers that the system truly pays for itself through energy cost savings in a short period of time. The system is based on our Signal Server Technology design. All features and control algorithms provided by the system have been successfully implemented at over 400 facilities. The system allows for plant-wide system control and can quickly be custom configured to suit a specific customer's needs. The operating system provides drivers to monitor/control standard PLC I/O rack component systems produced by all major manufacturers (AB, GE, Opto22, AutomationDirect, etc...). The operating system and associated refrigeration control software have evolved together over the years to become a product that can now be easily configured to literally handle anything a customer may need to do with an environmental control system. LOGIC Technologies, Inc. has been providing complete turn-key control solutions to our customers since 1980. All control panels required for the solutions that we provide are manufactured in our fully equipped ETL-listed panel shop. 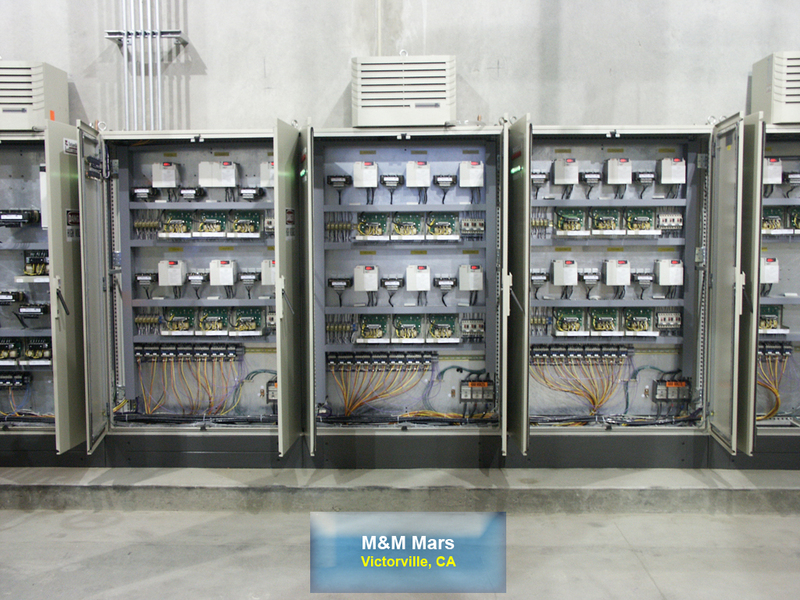 This includes micro-controller, server, input/output rack, and motor control center panels. Our modular construction enclosures can be customized to resolve most space limitation issues. From simple pushbutton stations to the largest panel you can imagine, we have the equipment and experience required to produce it. Each panel is built to stringent standards using industry-standard equipment. All panels are rigorously tested prior to shipment to insure a smooth implementation of the overall solution. As is the case with most panel shops, we have standard component preferences; however, customer specified components or standards are no problem for our experienced staff members. Our core system provides support for all major manufacturers' I/O components. Systems are routinely designed and assembled using AutomationDirect, OPTO22, and Allen Bradley I/O structures.